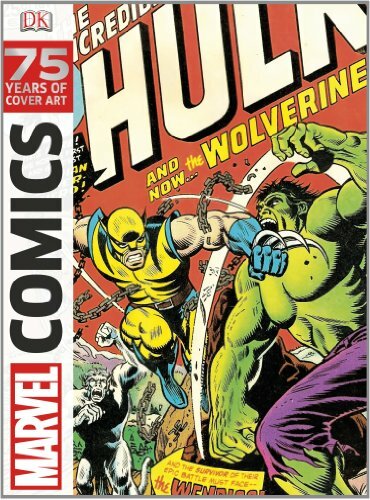 Here's a wonderful book to celebrate the 75th anniversary of Marvel Comics. It's a large oversized 320-page slipcase hardcover edition published by DK. Oh and the book comes with two prints (Spider-man and Iron Man) that are larger than A4. Many of the old covers have been digitally restored, so you don't really get to see those old school halftone patterns used for flat colours in the past, or the yellowing paper or textures. Even the very old comics from way back 1939 are restored to brilliant colours, sometimes too brilliant. It's a good and bad thing. Some would prefer the authenticity of scanned covers for sure. The result of the digital colours can feel a bit weird at times. It's like looking at the 50s comics thinking that in those days they already have powerful computers to fill all these colours. The covers are divided into four chapters each covering a comic era, namely The Golden Age (1938-1956), The Silver Age (1956-1970), The Bronze Age (1970-1986) and The Modern Age (1986-present day). Within each era, the comics are arranged into their "families", e.g. Avengers titles will go together. The organisation is pretty logical. For The Golden Age and Silver Age, they stop at page 65. So the bulk of the covers are from 1970 to present day. It's a pleasure to see how Marvel comics have evolved in style and maturity over the years, and also the well known and not so familiar artists who have contributed. The covers are usually printed full page or 2 on a page. The huge prints are a joy to look at. Other than the foreward by Adi Granov, the rest of the text are captions to covers provided by author Alan Cowsill. The captions talk about key events that happen in Marvel's history, such as the launch of new titles, particular story arcs being introduced and other insights. There are also occasional but brief artist profiles for the pioneering and prominent artists, such as Jack Kirby, John Buscema, John Romita Sr and a few more. This is an inspiring book that tells the history of Marvel comics through the covers, although it's not the complete history. It should make a fine companion to Marvel Encyclopedia which was also updated this year to celebrate Marvel's 75th anniversary. Highly recommended to comic fans and artists. That's the slipcase on the right. The book comes with two prints that are larger than A4.